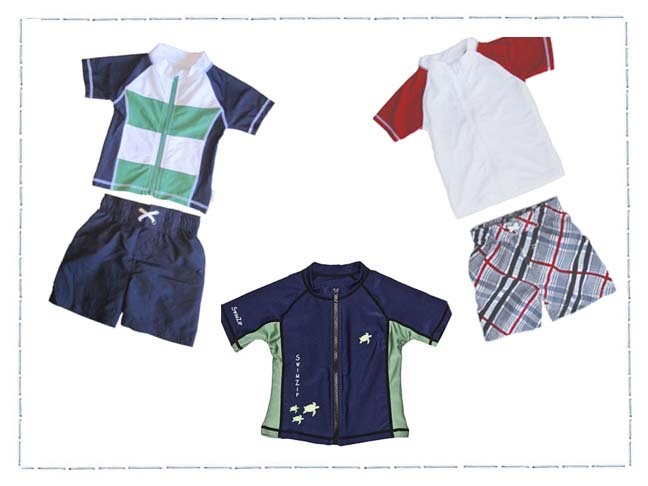 SwimZip swimwear not only offers a practical design that both parents and children love, the pieces are safe and effective when it comes to blocking and preventing damage from the sun’s harmful rays. With the warm summer months quickly approaching, sun awareness and safety is important to remember while out at the beach, pool or playing with water toys in the backyard! The fun, hip and stylish Beach Bum Style SwimZip UV Shirt ($29.99) protects your child’s delicate skin and is sure to be the talk of the beach. Pair this super cool striped swim top with a simple pair of navy blue swim shorts and finally say goodbye to “plain” protective swimwear! The Surfer Dude SwimZip UV Shirt ($29.99) matches well with any patterned swim shorts. Wouldn’t this be a perfect swim shirt for a Fourth of July beach or pool day? The South Seas Turtle SwimZip UV Shirt ($24.99) reminds me of Hawaii – with the sea turtles and serene colors. Pair this simple and tropical swim shirt with your son’s favorite swim shorts and he’ll be comfortable and safe while on the sand or in the water.